prenderama11 has no other items for sale. 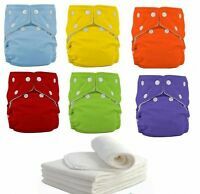 Details about Charlie Banana Reusable Cloth Diapers One Size Set Of 6 Used Once! Charlie Banana Reusable Cloth Diapers One Size Set Of 6 Used Once! LilBit Baby Reusable Pocket Cloth Diapers Set, 30% Off, Free US Shipping!